Microsoft boasts that more than 200,000 businesses are using Teams, mostly large enterprises. Its free version hooks smaller businesses on the way up. 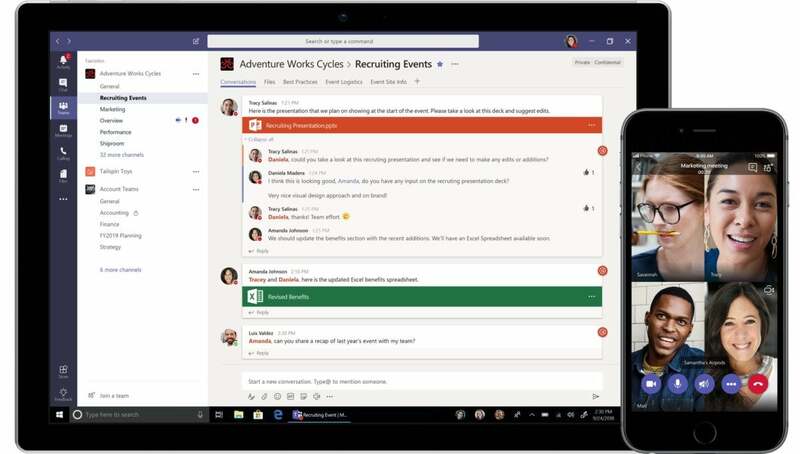 On Thursday, Microsoft began offering a free version of Microsoft Teams as an incentive to switch over from Slack—and is loading it up with key features such as unlimited chat messages. Earlier this week, Slack said it was improving its own in-app search, with automated suggestions. Slack’s free version still limits users to 10,000 searchable messages, though—and Teams does not. That’s one of the key selling points of the new free Teams service; the other is the number of users—300—which will be enough for many small businesses. "For us, it was all about continually breaking down barriers to [Teams]," said Lori Wright, General Manager of Microsoft 365 Teamwork, in an interview. "We don’t necessarily think you should be an Office 365 subscriber to experience the power of the Teams solution." That said, Microsoft is, in fact, reserving key features for the paid version of Teams, which is built into Office 365. Video chats that are conducted within Teams—which is replacing the standalone Skype for Business application—can be stored in the cloud, and is searchable, and features automatic captioning as well. In the future, Microsoft said, it will include facial recognition, so that viewers can search for what was said, as well as who said it. A public preview of "live events," video broadcasts that can be transcribed, archived, and timecoded, will debut this summer. Microsoft is also making one more freebie available to Windows 10 users (not Teams): Whiteboard, the inking app that Microsoft first introduced last summer. Beginning Thursday, the Whiteboard app is freely available for Windows 10 and iOS. Whiteboard taps some of the features that it first introduced with OneNote, such as the ability to create machine-generated flowcharts and charts from inked shapes. 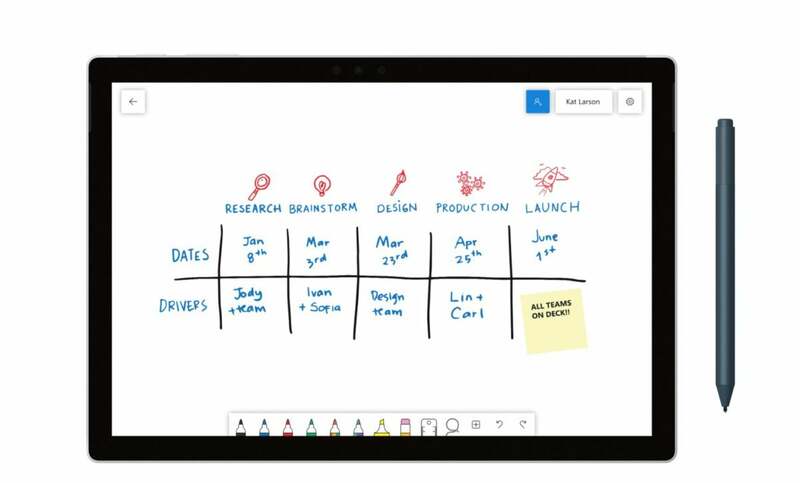 Microsoft’s Whiteboard app is a simplified drawing app, optimized for collaboration. If your workplace subscribes to Microsoft’s MyAnalytics service, you may see something a bit odd later this summer, within Outlook. 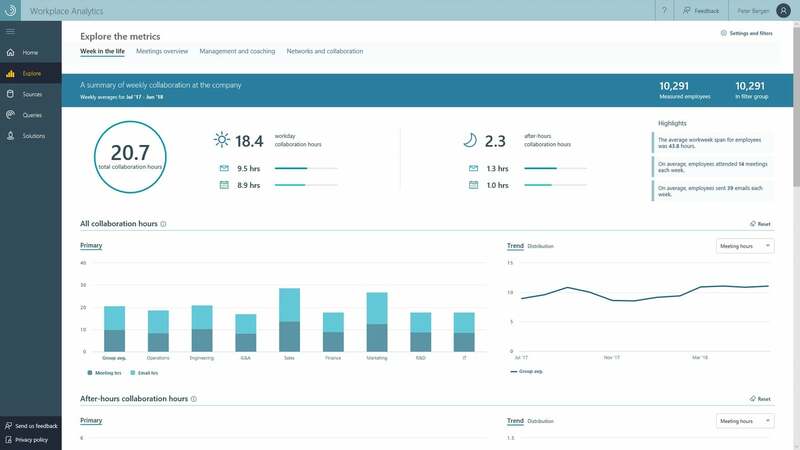 Microsoft’s MyAnalytics, which already can track how many minutes you’ve spent in meetings or reading emails, is getting a bit nosier. If you’ve set a meeting for an hour, for example, Outlook might suggest you try to finish up n 45 minutes, to give attendees more free time. Too many meetings on your schedule? Outlook might suggest building in some personal "focus time." And if you’re trying to send emails to colleagues at 2:00 a.m., Outlook might gently suggest you downplay the urgency of the message. Microsoft’s MyAnalytics dashboard is remarkably detailed. Microsoft hasn’t said whether these "nudges," as the company calls them, will migrate to the paid version of Outlook. If they do, expect to see a few raised eyebrows among the general public.